Have you ever wondered why Birmingham&apos;s Colmore Row business district has such an eclectic mix of architecture? The answer may lie in the fact that it was spared the worst of wartime bombing and remains one of the most architecturally intact areas of Birmingham. The "new" buildings of the 1960s and 1970s follow simple modernist patterns, are of good quality and fit perfectly with their older neighbours. The care and comparative restraint of development in the Colmore Row area - unlike many other parts of the city - is intriguing. There are a number of modernist buildings of different styles, some of them beautifully conserved, others having been "developed", resulting in the unfortunate loss of their original Modernist integrity. Starting in Great Charles Street, near its junction with Newhall Street, you will find two very different versions of Modernist style. 40 Great Charles Street, Devonshire House, designed by Essex, Goodman and Suggit in 1954, takes a form that harks back to Art Deco. Above the striking portico of classical columns rises an unmistakably Modernist-style central panel of windows and vertical fins in Portland stone, framed by a set-back surround of stone with inset windows. In contrast, 36 Great Charles Street, by Elden Minns & Partners and built in 1973, has a rich façade of Inca-patterned cast-concrete panels. We love the vibrancy and the fun expressed in this detail. These buildings hold their own amid the grandiosity of their surroundings and both seem quite free from the "prettification" that has befallen other Modernist buildings we encountered. Continuing up Newhall Street you will find Edmund House, designed in 1962/3 by Fitzroy Robinson & Partners. Herbert Fitzroy Robinson was a prolific architect who collaborated with Sir Basil Spence in the design of a number of Modernist and Brutalist buildings of note. Edmund House was 11 storeys of Portland stone, windows and pale grey infill panels which made it a simple, pleasing building until a truly ugly, three-storey portico and dark cladding was added some time in the 1980s, turning a quiet, well-proportioned building into something akin to a 1950s juke box. Across the road, No 11, Newater House, is well worth a look, another simple building with soaring metal fins framing an elegant rhythm of windows and stone panels. Here "improvements" of stone cladding and an unsuitable glass and steel fan-shaped canopy are less intrusive and the quality of the building can still be appreciated. A detour down Edmund Street will take you to No 120. This wonderful building is faced with Portland stone, framing a simple, clean grid of windows atop a broad pediment and balconies with inset railings which run the whole width. All together a sophisticated, if understated, piece of architecture, unfortunately now compromised by the addition of a heavy granite wall and pillars. Masking the original central portico is yet another steel and glass canopy. Back in Newhall Street you cannot miss the large gap next to Edmund House. This was the site of the NatWest Tower designed by renowned Birmingham architect John Madin. Architectural critic Andy Foster described the building as being "the most important Brutalist commercial building in the city" - now obliterated to make way for "Birmingham&apos;s tallest new tower". Around the corner in Colmore Row, a magnificent sweep of Victorian and Edwardian buildings are found, and beyond, the beautiful open space that frames Birmingham Cathedral. At the other side of the cathedral, in Temple Row, stands No 55, originally the Bank of England building and certainly one of the finest Modernist buildings we have left. This unashamedly Brutalist building has presence writ large, standing four-square on a raised podium. The monumental rhythm of stone caissons framing large rectangular windows, tied together with copper clad beams is crowned with a muscular pediment which echoes the Art Deco period and eloquently expresses the strength and power of its original purpose. The quality of the building materials is evident in the combination of Portland stone with panels of Fossiliferous Limestone which adds a unique texture to the whole. Designed by Fitzroy Robinson & Partners in 1969, it was one of three similar Bank of England buildings, the others in Newcastle and Manchester. This walk, a fascinating voyage of discovery, shows what can be done with our heritage buildings without demolishing or spoiling them with glass and plastic cladding. For the most part, developers have managed to satisfy modern business needs with imagination and ingenious solutions which have added some lovely ultra-modern spaces and efficient buildings while preserving the historic character of the area. Could this be a blueprint for how we should approach the conservation of all our built environment? 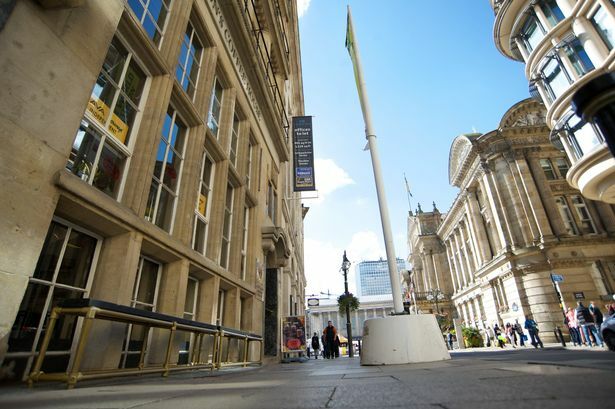 To quote council leader Ian Ward (Birmingham Post, February 15): "This is a city with a rich and proud history and it is absolutely essential to invest in our heritage and never forget the past." That past also includes gems from the post-war period. We are, after all, only temporary custodians of our built environment.